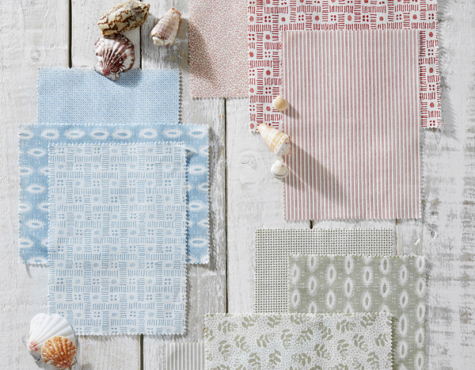 Nile & York was founded in the 1990s to produce classic, timeless patterns that are designed and coloured to work with single or multi-coloured fabrics. The first range developed from a silk lining printed by Nile & York for world-renowned interior designer Jane Churchill. From the success of this lining, the Small Prints range was created by the owner, Simon Greenland, using five designs each printed in the same six colours. Nile & York’s Small Prints is now regarded as a classic and contains 63 fabrics, based on nine small designs covering a wide range of design styles. Small Prints has now been joined by the recently-launched Small Linen Prints range, based on a linen/cotton fabric woven in Scotland and printed in England. The range comprises 39 fabrics using five original designs created in house by Simon Greenland and is designed to coordinate with many interior moods and styles. Nile and York has always been committed to supporting the British textile industry, and its ranges are all, and have always been, produced in the UK.